Like some of my earlier posts about obscure (or deliberately obscured) documents from Rome, this comes into the category of what we might call 'What Does the Church Really Say?' The documents I have looked at vary in authority but they are part of the Ordinary Magisterium, they establish a cumulative case against a lot of liberal assumptions. In this short series I am going to look at a couple of very interesting documents produced by the Congregation for the Oriental Churches. First, in this post, a little background. The Oriental Catholic Churches, the ones in communion with the Pope, have endured a sad history of 'Latinisation': the adoption of the liturgical and other practices of the Latin Church, which has flattened the rich diversity of the Universal Church and cut them off from the traditions still kept, in most cases, by Eastern Churches not in communion with Rome. Indeed, from the point of view of the latter this process was and remains a scandal and an impediment to reunion: if this is what happens when you accept Rome, they reasoned, then we don't want to have anything to do with it! However, the great Pope Leo XIII initiated a very clear policy of encouraging Eastern Catholics to preserve and restore their traditions in their integrity, and this was powerfully reaffirmed at the Second Vatican Council. It was easier said than done, unfortunately, since the leaders of these Churches were usually educated in Rome and were often eager to be as like their Latin friends as possible, even without any of the official encouragement of Latinisation which was in evidence in the 17th and 18th centuries. Nevertheless, important progress was made. In the meantime, of course, we had the liturgical reform of the West. Out goes (nearly all) silent prayer by the priest. Out goes worship ad orientem. Out goes the use of the West's ancient liturgical language. Out goes (a lot of) proskynesis, which in the West usually takes the form of kneeling and genuflections. Out goes the mystery, the awe, the timelessness and otherworldliness of the liturgy, and liturgical texts which anticipate the consecration (referring to the unconsecrated Host as 'this spotless Victim' in the Offertory). Out goes (a lot of) the sense of the sinfulness of the priest. Out goes the sharp distinction between Sanctuary and Nave, marked in modern times in the West by steps and rails. In comes a lot of new things like lay people distributing the Blessed Sacrament, secular musical styles, and so on. None of these things were, in fact, called for by the Second Vatican Council, with the partial exception of the use of the vernacular, but they happened, they were officially promulgated or, at least, permitted, and the theological rationales for them gained currency even if they were never explicitly endorsed by the Magisterium. Thus, Bugnini and his friends said that the pre-Conciliar Latin liturgy was illogical, that the stuff about sinfulness was 'negative' and unpastoral, that Latin, silence, and worship ad orientem excluded the Faithful and made them 'dumb spectators' at Mass, and that its historical development was a matter of 'accretions' which obscured the true, pastoral, and logical shape of the primitive liturgy. If this is true, then it is true in the East as well as the West: you don't cross some invisible line in the Balkans and suddenly find that human nature, logic, and the principles of historical development flip upside-down. The leaders of the Oriental Catholic Churches, accordingly, could hardly look at these arguments without seeing a systematic attack not only on the traditions of the West, but on the traditions of the East. Insofar as they wanted to be up with the latest trends, it was natural that they should seek to implement a version of the reform in their own churches, in direct opposition to the official policy of eastern traditionalism. Today we often feel ourselves prisoners of the present. It is as though man had lost his perception of belonging to a history which precedes and follows him. This effort to situate oneself between the past and the future, with a grateful heart for the benefits received and for those expected, is offered by the Eastern Churches in particular, with a clear-cut sense of continuity which takes the name of Tradition and of eschatological expectation. 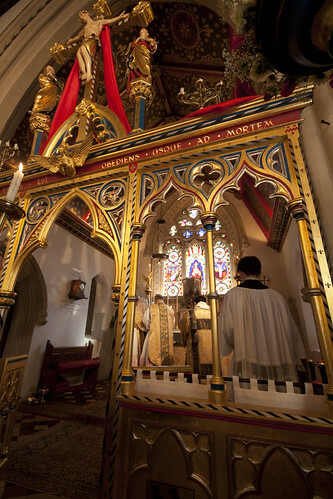 The Western Rood Screen served, as can be seen in the photos in the post, more to frame the action of the Mass than to prevent people seeing what was going on. It nevertheless places the importance of the symbolic separation of the Sanctuary, representing Heaven, from the Nave, representing Earth, ahead of considerations about sight-lines and feelings of 'inclusion'. The solid Eastern Iconostasis (Icon screen) takes this idea much further. 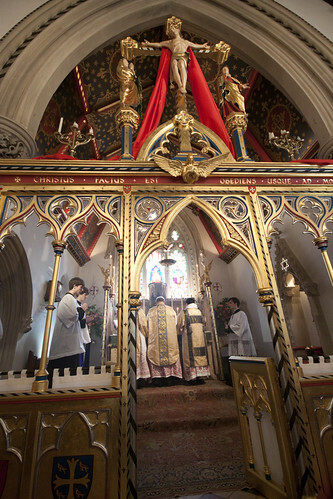 Rood Screens were often destroyed by 18th century western liturgists inspired by very similar ideas to those of Bugnini and his followers, and a new wave of hostility to them manifested itself after the Council. But if we can't tolerate Rood Screens, what can we make of the Iconostasis? The answer is that we need to distinguish that de facto but not de jure endorsement of the attack on Western traditions, from what the Church actually teaches about tradition. In the next posts I will discuss two documents of the Congregation for the Oriental Churches which discuss the principles of liturgical reform, with this in mind. Some of these issues and texts are discussed in two of the FIUV's short Position Papers: On Liturgical Piety and Participation, and on Liturgical Pluralism (pdfs). 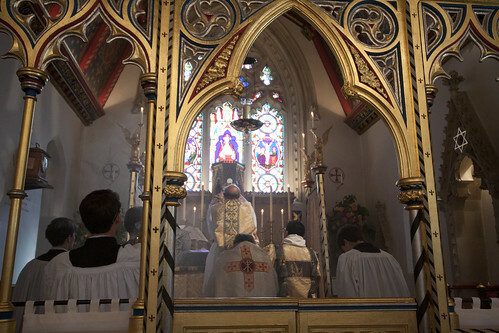 Photographs: more from this Mass can be seen here. Another difficulty is that many Eastern Catholic Churches associate the Roman liturgical overhaul with the Council and form an attachment to those changes while oblivious to their departure from Roman norms. An example is introduction of the vernacular. Melkite patriarch Maximos, of blessed memory, famously intervened at the Council and made the case for vernacular liturgy—the custom of the Church of Antioch—with the Fathers greeted with enthusiasm (all despite the fact that vernacular ceased to be Latin over a millennium prior to the Council). Many Melkites now fondly remember that occasion and may perceive a return to high volumes of Latin as a reversal of their contribution; yet the Melkites are by far the most de-Latinized of the Eastern Catholics (aside from a few feasts and the presence of marriage vows). Thanks for this. I look forward to the rest of the series. As an Eastern Catholic who has been critical of liturgical reforms in the West, and who maintains that the extraordinary form has many more strengths than the ordinary (see here for example: http://easternchristianbooks.blogspot.com/search/label/Catherine%20Pickstock), I'm glad to hear from the "other side" as it were and to find common ground in this struggle for "liturgical recovery" in the West. "... more to frame the action of the Mass..." An interesting article, but I would like to question your evidence for this comment regarding Rood Screens in the Latin Church, which seems to say they were more "open". Of course my comments are directed to medieval use, as by the Counter-Reformation things really had changed. Behind that there were also structures with altar curtains (another level of veiling the altar and its "own space"); they are shown on "architectural ciborium's", or baldachin's (here the curtains are called "tetravela"). Interestingly the the word baldachin itself actually refers originally to a luxurious type cloth from the east. These structures and curtains are regarded as the later medieval ancestor of the "riddle posts and veils" in some northern European traditions. It is not always clear if the curtains were originally drawn all the way around the ciborums, but some images would indicate it was the case, and the rails still exist, though how and when this was done in the liturgy is not clear in the Latin tradition. Veiling does seem to occur in the less sacred moments however, with attention then being draw by the unveiling to the more sacred, as would still be the case in a more minor sense now in what remains of the traditional Latin liturgy. It must also be born in mind that architecturally most "pulpitums" were far from being "open" structures too, and really served to screen the quire rather than the sanctuary per-se, especially in churches that had religious communities. What gets more fascinating (in this archaeologists opinion) is that with the high medieval development of the private "missa lecta" numerous side altars, or "Jesus altars", appear in-front or outside the veiled and screened areas, which were still used for the full sung liturgies. What is clear is that there were distinct spaces that were screened and veiled in the chancels. The "altar space" itself was veiled yet again, with the actual altar being covered itself as well. That veiling of the altar space being directly connected in contemporary material to the Holy of Holies and concepts of the "Temple", while the altar is seen as the "body" of Christ. It was after-all the most sacred object in the church (when the Sacrament was not reserved). Layers of meaning, and symbolism drawing on Judaic and Christological symbolism united together and shown in continuity. Veiling is fundamental to this I think, which was how something scared was/is indicated. It is the veiling that mattered (and still does) not the screening, which was perhaps just an architectural development of the same. This was no different in the secular world as well. This is all very interesting. You don't deny, however, that the Rood Screen did not prevent the people from seeing the Elevation for example. Eamon Duffy gives abundant evidence for the importance of seeing - 'gazing' - in the medieval conception of liturgical participation. This indicates a certain contrast with the East which is all I wanted to suggest. No I don't deny it for that moment, and Duffy's work is interesting and groundbreaking in many respects. Of-course we don't actually know how the veils and screens were used in the Latin Liturgy as a whole, but I think it was similar to the ancient Eastern Rites and Orthodox practice, and the material evidence would indicate this. The doors in the screen (or veils at the entrance to the sanctuary) are also open at the Epiclesis and Consecration in the East and Orthodox Rites, though without the explicit elevation as the Latins know it in the high medieval liturgy. I would think the "framing effect" (that you speak of) East and West would have been very similar, with only the view through the "central doors" at certain moments, like at the Canon and Consecration. Yes the "gazing", or showing/revealing, becomes increasingly important, and I agree with you. Duffy (if I remember correctly) hints at, or says that, this emphasis on the elevation grew out of a popular late medieval Latin piety, encouraging the celebrant to "show Our Lord", calling out for "Him to be raised ever higher". But I think there is also evidence which demonstrates that this action was only visible through this central area (door). It would perhaps explain why, for example, some late medieval screens that survive in England have "improvised" squints (holes in effect) made through the wooden panels below tracery above. There would have been no need if the tracery was left "open" as now; without the veils or with the veils drawn aside. What I find fascinating is what is "framed" - shown - and when. It is the most sacred that is being revealed (East and West), and not hidden away. Thank-you very much for the raising the points you do in these articles. Much appreciated. The target of these documents is not Latinizations from centuries ago, but ones being proposed and implements after the Council.